The second season of Pioneers Of Television debuts tonight on PBS at 8 p.m. Eastern and Pacific, 7 p.m. Central and Mountain, in most markets. Check local listings. TV documentaries about TV used to be something of a novelty. Television may have done more to change American life at every level than any other invention between the car and the personal computer. Still as recently as 1988, when PBS ran the ambitious, loudly hyped, and instantly forgotten series Television, there was still a lingering attitude that there was something ridiculous and self-serving about devoting serious attention to the history and effects of the idiot box. That was then; this is now. The current series Pioneers of Television feels so overly familiar, so devoid of any observations or facts that you haven't encountered a thousand times before, that it says a lot about how far we've come. Unfortunately, it also says a lot about how far PBS has deteriorated. This scrap heap of old news, dopey re-enactments, and interviews with people who haven't refueled their tank of anecdotes since their last comics convention looks like something the cat dragged in, and not even the cat that lives in the alley behind the History Channel building. More like public access. This is a shame, because the season premiere is devoted to one of the areas of early TV history that might still inspire a lively hour of nostalgia: science fiction. Documentaries about early TV comedy might give you the chance to see clips of Ernie Kovacs, Jackie Gleason, and the Your Show of Shows crew in their kinetic prime, but the price of that is having to watch a bunch of talking heads torture themselves and everyone in range of the sound of their voices as they try and explain how funny works. Tributes to the golden age of TV drama tend to consist of clips of the sweatiest actors you've ever seen heavy-breathing their way through dialogue extolling their common plainness and lamenting their despair at never getting to be prom queen, intercut with people assuring us that this stuff was all anyone wanted to talk about around the water cooler the next day. Discussions of classic TV sci-fi offer the promise of getting to hear wild-eyed, passionate defenses of, and theories about, something weird and tacky: then as now, just what pop culture is all about. The patron saint of TV sci-fi, and of cult TV in general, is Rod Serling, producer, star, and head writer for The Twilight Zone. (On Northern Exposure, when the impressionable young Shelly Tambo developed an addiction to satellite TV and sought help from the show's resident lanky hipster DJ, Chris, the writers couldn't resist having Chris assert his cool-cat bona fides by saying that he himself had never seen the attraction of TV, "'cept for the Zones.") According to contemporary pop culture legend, Serling, whose early TV plays (Patterns, Requiem for a Heavyweight) had won him fame, acclaim, and awards, was feeling boxed in as the networks became increasingly timid about the kind of "hard-hitting," socially conscious drama that his stock in trade, and so he created a sci-fi anthology series so that he could use genre stories as a delivery system for his messages about "the human condition." In other words, he snuck important messages about the futility of war and the evils of racism past the cowardly suits by decorating them with aliens and time warps. Or, as Bill Cosby used to say every week at the start of Fat Albert, if you weren't careful, you may just have learned something before he was done. The Twilight Zone, we're told, was "deeply rooted in the literary tradition of the short story." That's based on a definition of the literary tradition that starts with O. Henry and, on a good day, extends as far as Shirley Jackson's "The Lottery"; the best Zone scripts, such as Richard Matheson's "Nightmare at 20,000 Feet" and Serling's adaptation of the Jerome Bixby story "It's a Good Life" (which, between the two of them, later served as the basis for the better half of the 1983 Twilight Zone movie), start off with a hook and end with a snapper and kill time as snappily as possible in between. The fact that, as entertainment, they hold up so much better than Patterns might suggest that the evil network men who forced Serling to sneak his important messages in through a side door were unwittingly doing him, and us, a favor. Serling was a talented, intelligent man with a commitment to his craft, but considering his importance to TV sci-fi and fantasy, he sure was literal-minded. The producers of Pioneers managed to unearth, and include without the accompaniment of fart noises, a clip of Serling (who died in 1975) explaining that, because he wants his fantasy to be grounded enough in real life that audiences could relate to them, he might write a story that was set in 1998, but would "shy away" from setting one in 2005: That would be too far out. The Serling of Twilight Zone provided the template for Gene Roddenberry's media-friendly image as TV auteur when Roddenberry made his own mark with Star Trek. (Pioneers never mentions The Outer Limits, a show that continues to live in the Zone's shadow, which may have something to do with the fact that it isn't associated in the public mind with a single, self-promoting producer-hero figure.) Like Serling, Roddenberry turned to sci-fi after being frustrated in his attempts to deal with serious issues in a contemporary drama. 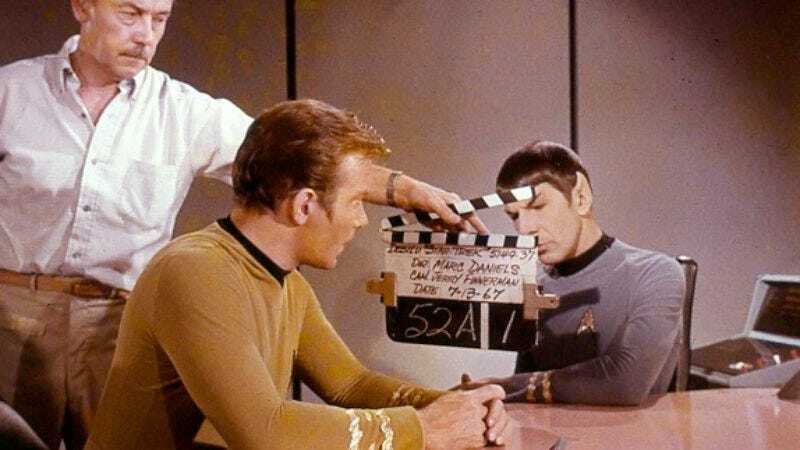 (Pioneers includes some intriguing, as opposed to good, clips from his pilot for The Lieutenant, a show with a military setting that Roddenberry intended to cast with a pair of leading men, one white and one black.) Roddenberry was certainly progressive-minded, but some of the claims made for how Star Trek pushed the envelope in setting the pace for social change in the '60s might have been burnished a little by forty-something years worth of hindsight. Was Lt. Uhura really such a groundbreaking TV depiction of an African-American woman just because she didn't cook? Nichelle Nichols herself had her doubts and says that at one point, she handed in her resignation in disgust over not having more to do on the show. She recalls being talked out of it by Martin Luther King, Jr., who not only urged her to remain on the show but described himself to her as "the biggest Trekkie" in the world. Pioneers isn't the kind of show that's going to mess with a story like that by asking whether the term "Trekkie" was actually in wide use during Dr. King's lifetime. The freshest take Pioneers has managed to come up with is to contrast Star Trek with Lost in Space, and Roddenberry with TV sci-fi's Dr. Evil, Irwin "The Master of Disaster" Allen. According to Pioneers, CBS originally pretended to be interested in Star Trek, just so that they could get free input from Roddenberry on how to make a space opera for TV on the cheap, or, as Pioneers puts it, pick his brain for "innovative cost-saving ideas." It's hard to believe that the network needed to engage in subterfuge in order to come up with the brainstorm that every planet in the universe could feature the same papier-mache boulders, especially with Allen already attached the project; Bill Mumy, who played young Will Robinson after he had already attained small-screen cult immortality by wishing people into the cornfield left and right on The Twilight Zone, recalls that Allen (who was also responsible for Land of the Giants, Voyage to the Bottom of the Sea, and The Time Tunnel) had a knack for turning out sensational pilots, but that as soon as the series would get picked up, he became interested only in cutting as many corners as possible. Unlike the forward-looking Star Trek, Lost in Space stands accused here of not just being cheaply made but campy. The charge is even made that it veered off course in candy-colored imitation of its time slot competition, Batman, which first appeared after Lost in Space had been on the air for four months. Maybe so, though I'd always heard that what set the tone for Lost in Space was the popularity of Jonathan Harris's lovable bad guy Dr. Smith, after Harris, who had no compunction about rewriting his own scenes to better showcase his flair for hambone shamelessness, took the project clean away from the manly squares who had been its intended heroes. ("There's no doubt about the fact that he played it huge", Bill Mumy says, thus shutting up anyone who was just about to argue that Jonathan Harris invented mumblecore.) One episode, "The Great Vegetable Rebellion," in which a deep-voiced guy in a carrot suit turns Dr. Smith into a humanoid celery stalk but is unable to get him to shut up, is singled out as perhaps "the most insipid" thing of its kind ever seen. If Pioneers were concerned that too close a look at the actual shows, as opposed to the claims made for them by their producers, would make their claims to possessing "greater relevance" look kind of silly, they should have considered the possibility that, by now, the straining for greater meaning is part of the camp appeal of Star Trek and The Twilight Zone, just as it's part of the enduring appeal of those early-'70s Neal Adams/Denny O'Neil comics where Green Lantern and Green Arrow piled into one of Ken Kesey's old buses and, like Peter Fonda and Albert Brooks, set off to find America and touch Indians. There actually are people with new, sprightly, idiosyncratic things to say about the history of TV, things that haven't been said a kajillion times, and there's no good reason why they couldn't be saying them on TV. Any chance they'll ever be asked to say them on PBS? The message of Pioneers of Television is: Don't hold your breath.